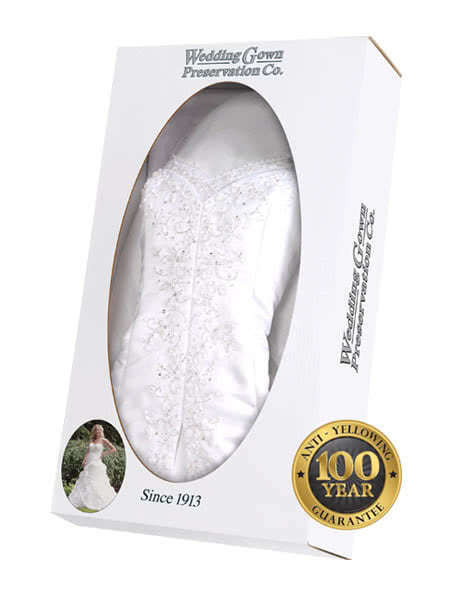 We are proud to be a leading distributor and an "Elite" rated dealer for the Wedding Gown Preservation Kit from the Wedding Gown Preservation Company. The Wedding Gown Preservation Company does not sell direct to the public but instead relies on it's experienced distributors to market and sell their leading service to brides across America. In 2012 we were excited to be awarded the "Elite Dealer" status by the company which is only awarded to top distributors of the kit. We've been working with WGPC for many years and are able to help brides navigate the preservation process while offering them the best prices on their wedding dress preservation. We're ready to help you with your preservation today. We encourage you to email us or call with any questions we help you with as you make the decision to preserve your most treasured memory from your big day. The only preservation service trusted by over 3 million brides and leading the way since 1913. Every kit ships absolutely FREE for preservation and safely back to your home. The advanced delicate fabric cleaning and preservation process & technology used on your gown is the same that is trusted by museums across the world. We guarantee our preservation package is the lowest price available. Our "No Questions Asked" 90-day return policy makes our kit a great gift for a wedding or anniversary.